Estimated insurance prices for a Ford F-150 Lariat Crew Cab Platinum 2WD are $1,448 every 12 months including full coverage. Comprehensive costs an estimated $354, collision insurance costs $572, and liability coverage costs around $364. A liability-only policy costs as low as $430 a year, and high-risk insurance costs around $3,106. Teen drivers pay the most at up to $5,236 a year. For a driver in their 40's, insurance rates for a Ford F-150 Lariat Crew Cab Platinum 2WD range from the cheapest price of $430 for minimum levels of liability insurance to a much higher rate of $3,106 for a driver who has had serious violations or accidents. Where you live has a large influence on the price of auto insurance. More rural locations are statistically proven to have more infrequent comprehensive and collision claims than larger metro areas. The price range example below illustrates how location helps determine insurance prices. These rate differences highlight why anyone shopping for car insurance should compare prices for a targeted area and their own driving history, rather than using price averages. Auto insurance rates for a Ford F-150 Lariat Crew Cab Platinum 2WD also have a wide range based on physical damage deductibles and liability limits, your driving characteristics, and the model year. Where you choose to live has a huge impact on Ford F-150 Lariat Crew Cab Platinum 2WD insurance rates. A driver around age 40 might see rates as low as $1,060 a year in states like North Carolina, Indiana, and , or as much as $1,950 on average in Louisiana, Montana, and Michigan. Rates by state and city are shown later in the article. With such a large range of rates, the best way to figure out who has the best auto insurance rates is to compare rates and see how they stack up. Each insurance company uses a different rate calculation, and quoted rates will be substantially different. 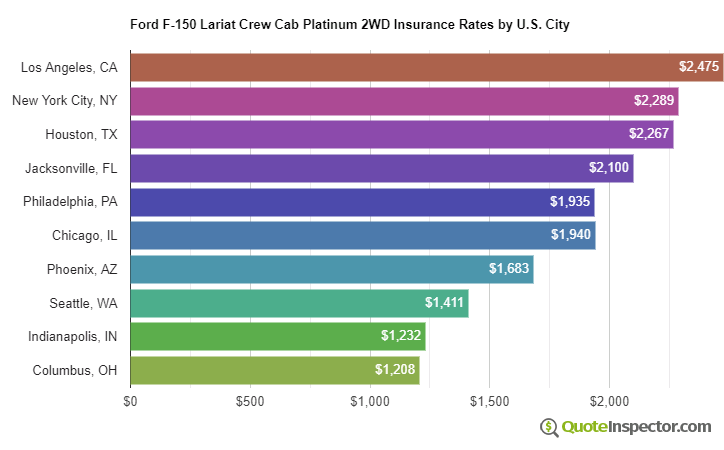 The chart above shows average Ford F-150 Lariat Crew Cab Platinum 2WD insurance rates for various coverage choices and risks. The cheapest rate with discounts is $837. Drivers who choose higher $1,000 deductibles will pay $1,238. The average rate for a driver around age 40 using $500 deductibles is $1,448. 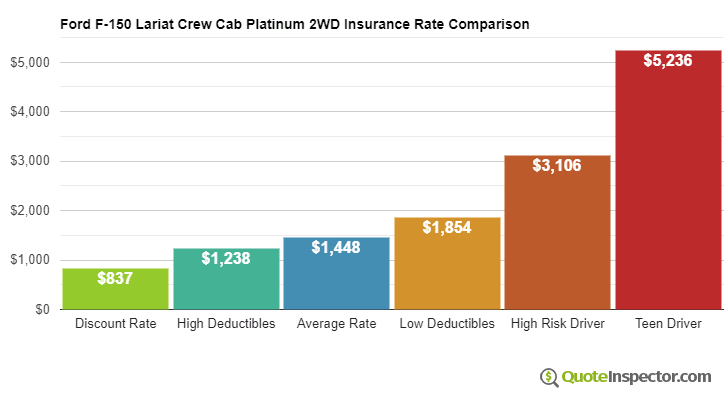 Using more expensive $100 deductibles for collision and other-than-collision coverage could cost up to $1,854. High risk drivers could be charged up to $3,106. The price for full coverage insurance for a teenage driver can be as high as $5,236.